A large crowd gathered at the RSU 54 school board meeting on Thursday to express support for and opposition to the school's Indian mascot. 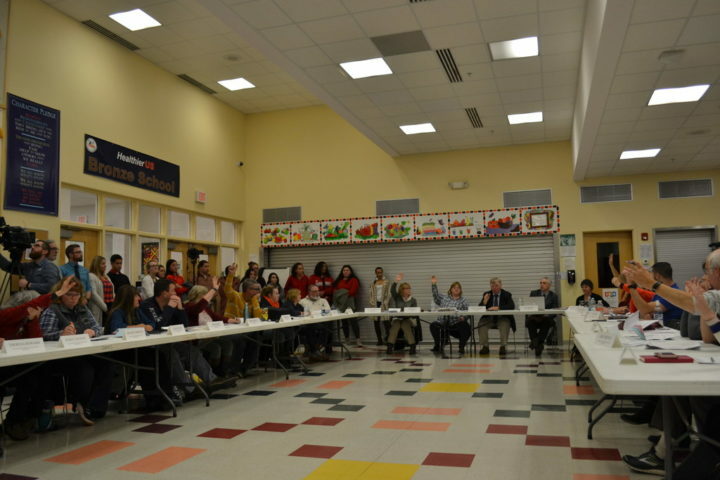 Thursday’s meeting of the Regional School Unit 54 school board unfolded in the same way a number of other school board meetings in Skowhegan have in recent years: It started with a lengthy, impassioned debate about the district’s mascot, the Indians. A vocal segment of residents want to keep it, saying it represents years of town heritage. 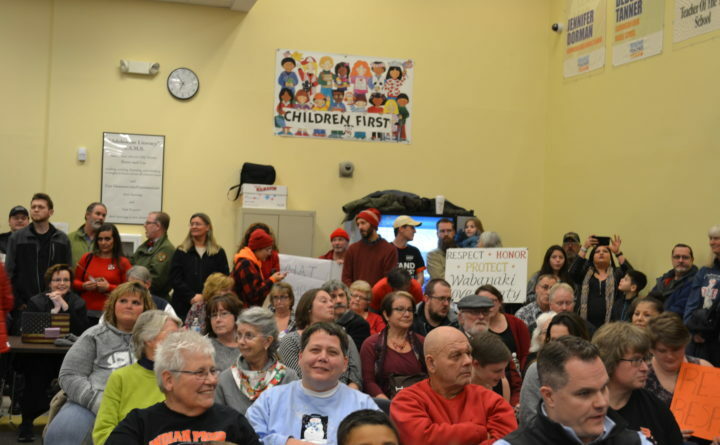 Another, equally vocal segment of district residents, alongside many more Native American people and organizations, remain firmly opposed to the name, arguing that it is racist and demeaning. The debate is still far from settled after Thursday’s meeting in the last school district in the state to retain a Native mascot. Arguments have regularly erupted on social media in recent years, and people on both sides of the issue have made threats of violence. Last week, the American Civil Liberties Union of Maine issued a statement condemning the continued use of the Indians mascot, and Gov.-elect Janet Mills weighed in before Thursday’s school board meeting, writing in a letter to school board members that she supported the mascot change. Ultimately, the board decided to hold a public forum Jan. 8 to allow more people to speak on the issue, though it is unclear whether a vote will take place. School board chair Dixie Ring and Superintendent Brent Colbry didn’t respond to requests for comment. Absent a school board vote, supporters of a mascot change say they’re starting to look at legislative options. The town of Skowhegan’s history with Native peoples — specifically, with the Norridgewock tribe of the Abenaki — stretches back centuries, and like many shared histories between Native people and Europeans, it is fraught with violence. Most notably, in 1724, at least 30 Norridgewock Abenaki people were massacred by white settlers in what is now Skowhegan. Most of the remaining Natives who lived along that part of the Kennebec River fled east, to what became Penobscot tribal lands, though there are still people living in the Skowhegan area who can trace Native ancestry back through those generations. Despite that violent past, Skowhegan — an Abenaki word that roughly translates to “watching place for fish” — has, centuries on, come to incorporate Native imagery into its identity as a town. The 62-foot sculpture of a Native American, created by sculptor Bernard Langlais and erected in 1969 to commemorate both Maine’s 150th anniversary and Native peoples, is an icon of the town. The town seal features a Native person. And the school mascot is an Indian. Maulian Dana, tribal ambassador for the Penobscot Nation and perhaps the most prominent voice on the mascot issue statewide, said that a school mascot is different from a work of public art, or a town seal, or a town name that comes directly from the Native people who lived in the area 300 years ago. Jennifer Poirier, a school board member and the moderator of a mascot-supporting private Facebook group called Skowhegan Indian Pride, takes issue with characterizing her support of the mascot as racist. It’s a tribute to Native people, she said, and people who want it to change simply do not understand that. The debate illustrates how powerful a thing school pride can be, something Mills alluded to in her Thursday letter. For those who have generations of family that have attended a particular school, a large part of one’s identity is wrapped up in the day-to-day activities of the school — academics, arts and, often most strongly, in sports. Poirier, who has children in Skowhegan schools, said that what other towns choose to do makes no difference to her. Nevertheless, more than 30 Maine schools over the past 15 years have either retired their Native-themed mascots altogether or changed the imagery to remove all references to Native peoples, including most recently Newport’s Nokomis High School, which is dropping the Native American imagery tied to its Warriors mascot. One of the first districts to change it mascot was RSU 34, formerly MSAD 34, which comprises Old Town, Alton and Bradley. In 2006 and 2007, it removed its Indians mascot and replaced it with the Coyotes. Old Town schools had perhaps the biggest incentive of any school district in Maine to make the change, as the Penobscot Nation’s Indian Island — one of five reservations in Maine and the state’s most densely populated — is just a bridge away from Old Town, and many Indian Island teenagers attend Old Town High School. At the meeting on Thursday in Skowhegan, Skyler Lewey, an Old Town High School sophomore and Indian Island resident, spoke about her dual identity as an Old Town student and a Native person. For Skowhegan, the mascot issue first came up in the late 1990s, when members of the American Indian Movement asked the board to change the mascot for the first time. In 2000, the school got rid of its large “Indian head,” a caricature of a Native person worn as a headdress during sports games. The school later stopped using imagery of Native people, and it introduced curriculum about Native Americans into the classroom. The name remains, however, even after continued pressure over the years from mascot foes, and several school board votes. The most recent one was in 2015, when the board voted 11-9 in favor of keeping it. 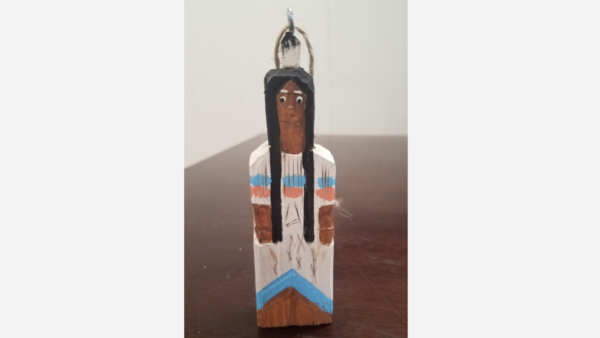 The Skowhegan Area Chamber of Commerce canceled a "Hunt for the Indian" event and will stop selling wooden Native American figurines. A handful of incidents have inflamed the issue in recent years, including a December 2017 holiday shopping promotion by the Skowhegan Area Chamber of Commerce that encouraged shoppers to “hunt the Indian” and look for a Native American figurine in a local business; those who found it would get a shopping discount. In 2015, a Skowhegan High School baseball coach posted a picture of a “scalp towel” on Facebook, an item used during games in the 1980s by Skowhegan sports boosters. Though there are many in Skowhegan who favor keeping the mascot, there are many who would like it to change. Sue Cochran, a local doctor and former school board member, said that while everyone, pro or against, comes from a place of love for the community, the fact remains that as long as the mascot is in use, Native people are hurt by it — whether the hurt is intentional or not. Dana says she has met with a number of leaders in Augusta and with members of Gov.-elect Mills’ team to discuss potential legislation enacting a statewide ban on Native American mascots or a resolution opposing them. States including California, Colorado, Michigan and Oregon have already passed such bans. Mills wrote in her letter that regardless of what does or does not change, that she believes it is not the mascot that gives a community pride — it is its people. Correction: An earlier version of this report misstated the number of Native American reservations in Maine.